I was thinking about starting with my dessert this year, but since we don’t eat dessert before dinner, you’re going to have to wait. 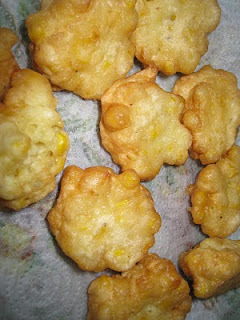 My mom made corn fritters this year and since I was there, I helped out by frying them. They’re not the healthiest, but it’s Thanksgiving, so there’s no counting calories and I couldn’t resist. They are super easy to make and great when topped with powdered sugar or maple syrup. So, so good! In a large frying pan, heat vegetable oil to fry the fritters. Once the one side is cooked and the oil is starting to bubble through the other side, flip over the fritters with a metal slotted spoon. Fry for a couple more minutes until golden brown. Drain and set on a paper towel lined plate. Drizzle with maple syrup or sprinkle powdered sugar on and serve!